My heart started to beat faster. I got a little a twinkle in my tummy. Everything was vivid and I was so alert. No, I was not having a pleasure response to a drug or alcohol. I heard a baby crow cry! That is right. When I hear that “Momma Momma” baby crow caw for his parents I go on alert. 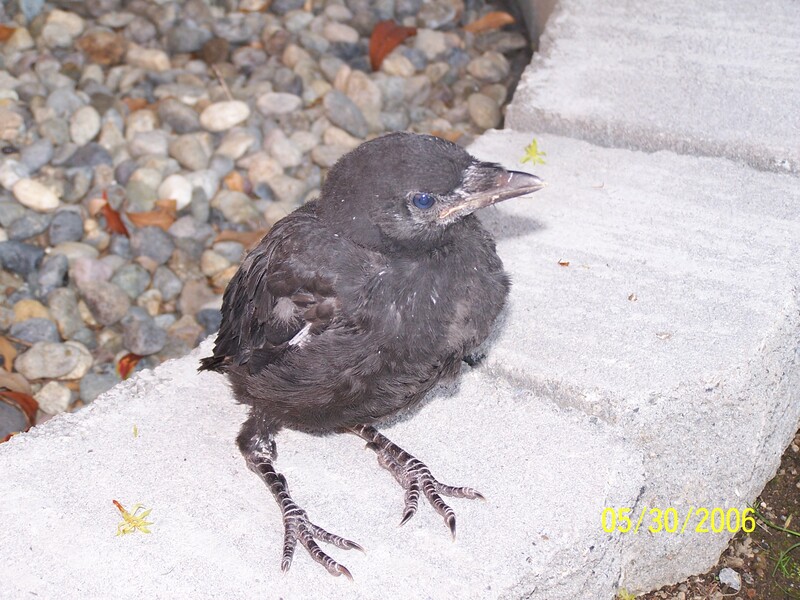 Something charges up my metabolism as I prepare for the hunt and savor the moment of serendipity finding a baby crow. Silly me! Addicted to a natural adventure that every spring is just outside the back door. How does one spot a baby crow you ask? Several techniques are in my bag of crow stalker tricks. Listen for the cry and follow that until you find the tree or high place it comes from. Binoculars are a good tool to have once you zero in on the location to enjoy some baby crow watching. You see a crow in your yard. This crow is hiding behind a bush or perching in a low shrub. When you approach they have blue eyes and the corner of their mouth has this pink puffy lip. If they cry and open their beak, you will see an all pink mouth. That is a baby crow fresh out of the nest. Leave it alone unless a cat or other animal (or car) is about to harm it. Their parents will show up soon. Speaking of crow parents. They are like mother bears. I kid you not they will get very aggressive if you get too close to that baby. You might not even know a baby is around. Their massive cawing and/or dive bombing tells you to get away from their prodigy. 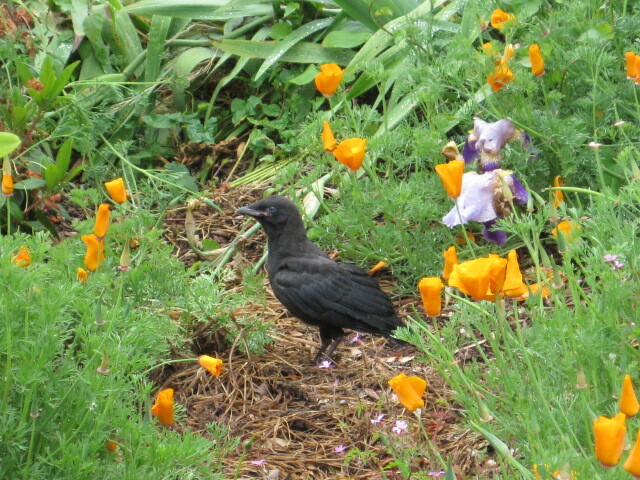 Since the little ones look like adult crows the baby might be in plain sight. I recommend you listen to those parents and step away quickly. It takes a village or large crow family to raise a crow. Look for crows perched around an area ever vigilant of humans, raccoons, dogs, cats, hawks, owls, eagles or any other predator. This is the crow equivalent of a security guard. You see a crow dive into the top of a tall fir tree. Not just perching on the limbs but they appear to be burrowing into a bushy area. You just discovered a crow nest. They build them from sticks up high and hidden away. Watch and listen for the other signs above and you might be rewarded by seeing a cute goofy baby crow emerge. I cannot say this enough…. do not disturb young wildlife. In most cases they will be just fine and their parents are coming back for them. We humans have good intentions but we are not equipped to prepare them to live in the wild world. They will imprint on you as their parent. That might seem cool but it will be a commitment for their life span. With all this knowledge you are now ready to enjoy their little cries and the thrill of finding them. Be careful! This nature thing is addictive. Excellent post! Lots of great information.